Beginning and ending in Bismarck, North Dakota, this new tour will explore some of the unique and fascinating historic places of the Northern Plains. 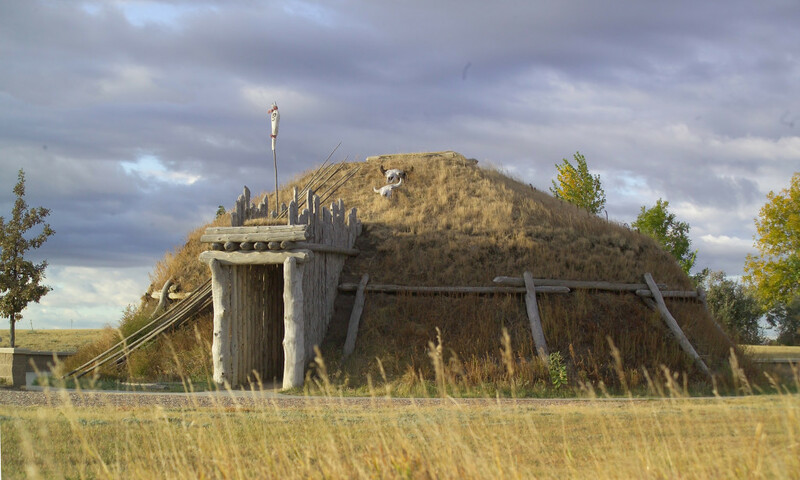 We’ll visit Knife River Indian Villages National Historic Site, which preserves the remains of five historic period Mandan/Hidatsa villages, including the “hometown” of Sacagawea, the guide for Lewis and Clark. We’ll also visit a number of prehistoric Native American sites including Double Ditch and Huff Indian Village State Historic sites, well preserved Plains Village Tradition villages, and the Knife River Chert Quarries, one of the largest prehistoric quarry sites in North America. Join us in Bismarck with an opening reception and a talk by a leading North Dakota archaeologist at the Bismarck Radisson. We’ll spend our first of two nights here. We’ll begin exploring the historical highlights of the Bismarck area with a trip to the North Dakota Heritage Center noted for its archaeological, paleontological and historical exhibits. We’ll then visit Fort Abraham Lincoln State Park, the headquarters of George Armstrong Custer’s Seventh Calvary and the point of embarkation for its ill-fated journey to the Little Bighorn. While there, we’ll investigate the partially reconstructed On-a-Slant Indian Village. We’ll have a picnic lunch on the grounds before driving north of Bismarck to visit Double Ditch Indian Village State Historic Site. Double Ditch preserves the remains of one of the largest prehistoric villages in North Dakota. The 15-acre site, encircled by a series of walls and ditches, has a commanding view of the Missouri River, scores of house basins, and trash mounds rising to 15 feet. We’ll return to Bismarck for the night. We’ll drive about an hour north to Washburn, home of the Lewis and Clark Interpretive Center and Fort Mandan. The interpretive center tells the story of the Corps of Discovery’s 1804-1806 journey to the Pacific and back. Fort Mandan is a reconstruction of the fort where the Corps spent the winter of 1804. In the afternoon, we’ll visit Knife River Indian Villages National Historic Site which preserves the remains of the village where Sacagawea met Lewis and Clark. The exhibits tell the story of the three principal Mandan, Hidatsa and Arikara villages that occupied the property. We’ll spend the night in New Town on the Fort Bernhold Reservation. We’ll occupy the next morning learning about the Mandan, Hidatsa and Arikara, and touring the Three Affiliated Tribes Museum. In the afternoon we’ll drive to Medora and begin our experience in the North Dakota Badlands. We’ll visit the Chateau de Mores Historic Site, the turn-of-the-century home of the Marquis de Mores, founder of Medora and a would-be cattle baron. We’ll visit Theodore Roosevelt National Park to view wildlife and learn of the future president’s life as a cowboy before returning for a final reception and night in Bismarck. Cost includes class hotel accommodations based on double occupancy (single supplement is $295), tour guides, fees, lunches, refreshments, cocktails and land transportation via air-conditioned bus with restroom. Not included is transportation to and from Bismarck and meals other than lunches. NOTE: A moderate amount of walking is required.